← Where I’ve Been and How? When I was at the Recurse Center, I wanted to try the caret package for R. It provides a unified interface for training various types of classification and regression models, and parameter tuning through resampling. I needed a project to work on, and since I love hockey and the Stanley Cup playoffs were just starting, it was a natural choice. The source code is all on GitHub, and is split into four R Markdown documents: scrape raw data, process data, train models, and make predictions. I’ll present a short summary here, and more details can be found behind those links. The repository also contains a Makefile to replicate the analysis. Random seeds are specified in the code to make it fully reproducible. I’m sure many more useful predictor variables could be derived from the play-by-play data, which in turn would result in more accurate predictions. But since this was mainly an exercise to try out caret, these variables will suffice for now. Next, I took the outcomes of all playoff series from the past 11 seasons, and calculated two deltas to be used as explanatory variables. I calculated the difference between the home team’s home performance and the away team’s away performance, and also the home team’s away performance and the away team’s home performance. This was to capture how the two teams would perform at the two arenas for the series. I then used caret to train five different types of statistical models on this training data. The methods I included were generalized linear model, linear discriminant analysis, neural network, random forest, and support vector machine with a linear kernel. For each, model parameters were tuned with 10-fold cross-validation, which was repeated 10 times. Parameter values with the best overall accuracy were used to fit the final model with all of the training data. My prediction for the 2015 Stanley Cup Champion was Chicago Blackhawks. To be clear, this blog entry was posted after the playoffs were already over. The explanatory text in the R Markdown documents was also written during the playoffs. But the same prediction as presented above can be seen in this GitHub commit (and the same HTML document on RawGit) from April 23rd. This was not before the playoffs started (April 15th), but when the first round was 3-4 games in, depending on the series. And since the playoffs are in fact already over, it means that the natural validation set is also available. 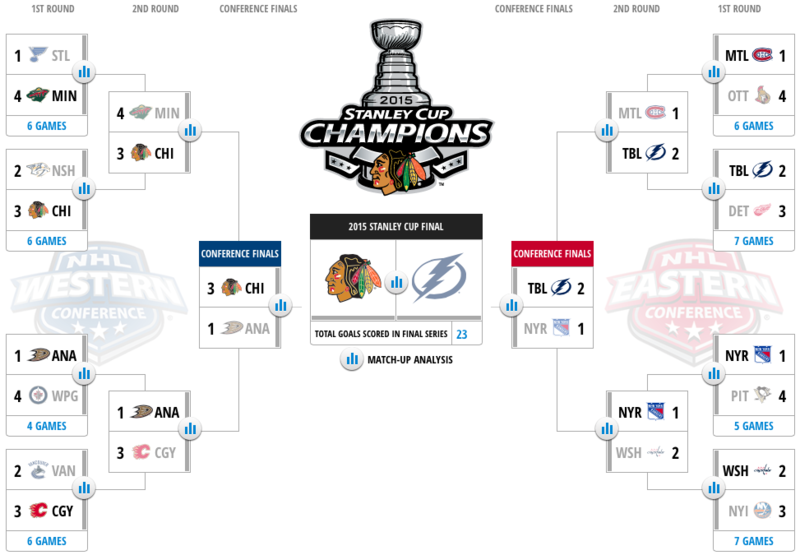 Chicago Blackhawks did end up winning the Cup, but how did I do otherwise? Below are the predictions again, now together with the real outcomes. And since an incorrect prediction in one round leads to wrong pairs on the subsequent rounds, I have added in the series that actually ended up happening. (I made a prediction for all possible games that could happen, but only presented the resulting bracket here.) These added ones are in italics. Overall, my accuracy was 11 out of 15, which is 73%. An obvious follow-up from here could be to look at each of the five different models (generalized linear model, linear discriminant analysis, neural network, random forest, and support vector machine with a linear kernel) and compare their accuracies against each other. This entry was posted in R, sports. Bookmark the permalink.